San Jose firefighters raced on Monday to put out a one-alarm fire at a recycling plant that they say started in a pit behind the facility. The fire was reported about 4 a.m. in the 1600 block of South 7th Street. It was "nearly extinguished" by shortly after 5 a.m., according to Fire Capt. Mike Van Elgort. On its website, Valley Services recycling facility said it’s been in business for 25 years. Van Elgort said that he has fought "at least five" fires at this same plant. Fires at recycling plants, he said are "fairly common, unfortunately" because of metals, such as magnesium" that routinely spark. 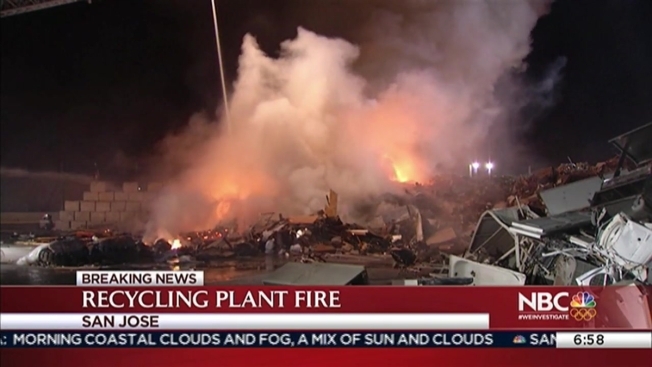 These types of fires actually occur pretty regularly at plants like this throughout the Bay Area, he said. In this case, the plant had a sprinkler going, as it should, but the fire got too big for the sprinkler to handle.